AUSTIN, Texas — On the basketball court, Victor Malimban prowls along the baseline as he waits for his teammate to slice toward the basket. In a thicket of limbs, Malimban emerges, shooting a short jumper from just inside the free throw line. The shot kisses the front of the rim, taking its time before bouncing into the hoop. The 40-year-old-old Malimban — all 5 feet 7 inches of him — runs stone-faced back down the court with his teammates. It’s a style of play that Malimban learned on the crooked rims and dusty streets of Manila. Gulang style is less about 3-pointers and pick and rolls and more about baseline trickery and sharp elbows to an opponent’s back when the referee isn’t looking. It’s a style out-of-step with the current American way of basketball adopted by younger generation of Filipinos. Malimban‘s team plays in the senior division; each member has been playing the game for decades. The team formed from a group of older players from the Filipino Basketball League in San Antonio. The league has existed there since the early ‘90s, save for a few years when it stopped because of too much fighting according to Lyndon Duano, the league’s organizer. It originated as casual games with potlucks serving pancit and lumpia and eventually became a twice-a-year, three-month tournament. Malimban picked up basketball on a makeshift court in the streets of Manila, with a backboard made of painted wood nailed onto a neighbor’s wall. The court was on the main street in the neighborhood and games paused when cars passed by, he said. Malimban played basketball because that’s what everyone else did. He started young, a shrimp to the older kids who crowded the court, and his job was to hustle and rebound. Basketball has long been popular in the Philippines. The Philippine Basketball Association is one of the oldest professional basketball leagues in existence, being founded in 1975, and claims to be the sound longest continuously running professional league in the world behind the NBA. Filipino ball has a unique geometry that is most apparent at the recreational-league level, where everyone stands 5 feet 8 inches or so. The players — especially the older ones — zigzag like knights on a chessboard. When everyone is short, the game is all about speed and trickery on two dimensions. Malimban’s teammate, Julius Paragas, exemplifies the concentrated fury of the Filipino baller. At the Austin tournament, Paragas, 41, attacked on offense with all the foolhardy, relentless bravado of a shorter Allen Iverson. The 5-foot-4 guard pounded the ball like a speed bag and dove into two defenders at a time, forcing himself into fight-or-flight scenarios before shooting tricky turnaround shots and reverse layups. Sometimes they went in. 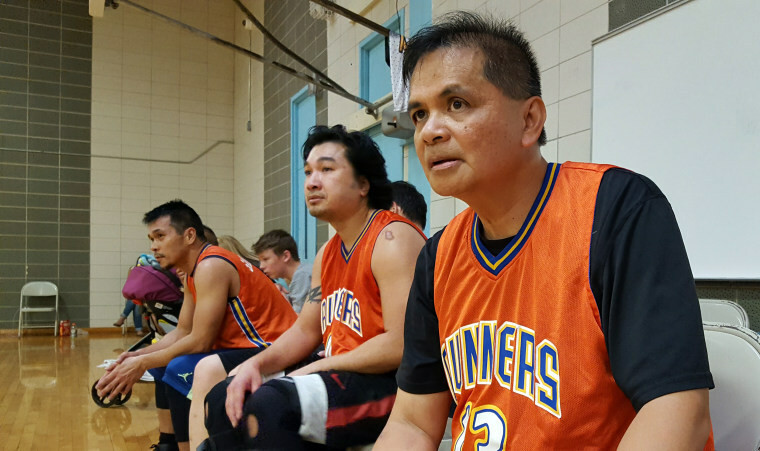 The kind of aggression is part of how elder players can tell if someone learned game in the Philippines or in U.S.
“In the Philippines if you shoot outside without driving you’re called a sissy,” Will Daprola, who at 59 is the oldest member of the team, said. Malimban arrived in America at age 11. His father was from the Philippines, he said, but his mother was from Vietnam. In California, and then in Texas, Malimban lived for pickup ball. He’d play every day after school, three hours at the same park with the same kids. His Manila childhood lessons in hustle and odd angles served him well. He played varsity ball in high school, and the American kids he met at the court became his friends and tutors in American customs and folklore. He and his siblings worked hard to fit in, to speak English, even as their mother kept her heavy accent, a mixture of Vietnamese, Filipino, and English that all mashed together when she was angry, Malimban said. He saw assimilation as a process of addition, like adding a jumper to his drive. He was polite when he visited his white friends’ homes, complimenting the food even as he wondered why they put butter on their rice. He still speaks Tagalog, but when he goes back to the Philippines now, he is the one with a “Yankee” accent. Basketball remained a constant for Malimban as he grew older. He sometimes skipped dates to play the game, he said; birthdays too. He’d show up late to work after morning meetings on the court. He reasoned that his girlfriend and his job would always be there. His ability to prove himself on the court may not. He perfected his role in basketball, a mixture of well-timed baseline play with hard-nosed and slightly-dirty defense. The problem in Austin is that the other teams play American-style ball. Many Filipino ballers tend to adopt the American style of play as they assimilate. They soon begin shooting threes like Steph Curry, and Euro-stepping like James Harden. Even those among the older generation begin to work on a more Matt Bonner-esque three-point set shot. But not Paragas and not Malimban. They play the game in Austin much as they did when they fell in love with the sport, even if it made everything harder than it needed to be. Near the end of the first half of the February game, Paragas slithers to the right baseline and shoots a semi-open step-back jumper. He misses, but Malimban teleports from underneath a Houston defender and grabs the rebound. He then tunnels underneath the basket and throws up a layup from the other side, which misses. The scrum for the rebound ends with Paragas wrestling the ball away and sneaking in a layup to cut the deficit by two. The other team flies down the court and immediately hits a corner three. The rest of the game unravels in the same manner. Each 3-pointer for Houston seems inevitable while each of San Antonio’s occasional threes seems to elicit a silent prayer of gratitude. Malimban's team loses the game by 30 points. After the game, the team walked to a nearby gym, where San Antonio’s younger players competed in the open division, the tournament’s most competitive. This game, with all players in their mid 20s or younger, barely resembled the dinosaur basketball in the other room. The San Antonio team started the game with a three-point blitzkrieg, moving like a flock of Kyrie Irvings, spinning into impossible layups, pulling up for long threes, and lunging for steals after letting their man go by. The team plays five-in, five-out, a roster of replaceable mechanical parts, with no one over 6-foot tall, and everyone able to shoot. Malimban’s team watched the youngsters with a sense of wistful regret. Paragas recalled his younger days, when his tenacious will was matched by a willing body. Malimban, too, said he can tell he is slowing down. He hurt his knee on the court last year, which has led to one injury after another. In their last game of the tournament, Paragas enters a rage, scoring over 30 points in a tough loss. He charged into the paint again and again, probing, relentless and foolhardy. The San Antonio team lost again, albeit narrowly. They left Austin without a win. Weeks later, when asked if one could still win playing gulang style, Malimban said no. Even he is learning how to shoot threes now, like everyone else. After all, how many points does individuality put on the board? There is no bonus for purity. He still isn’t comfortable playing the three point line yet. When he plays on the perimeter it’s as if he is wearing another man’s clothes. Still, he tries to adapt. A version of this story was originally published on DatWinning.